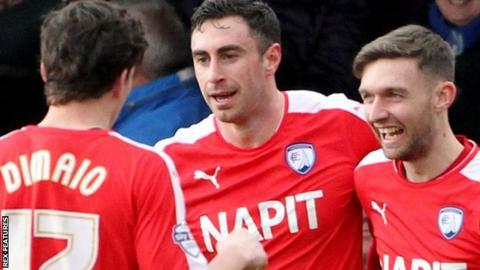 Lee Novak scored a last-minute winner as Chesterfield beat League One play-off chasers Southend to move six points clear of the relegation zone. David Worrall almost put Southend ahead, nodding against the post before keeper Tommy Lee saved his rebound. Chesterfield's Ollie Banks and the hosts' Tyrone Barnett both threatened, while Southend had a penalty turned down when Sam Hird felled David Mooney. With time running out, Banks teed up Novak to win it with a neat finish. Match ends, Southend United 0, Chesterfield 1. Second Half ends, Southend United 0, Chesterfield 1. Corner, Southend United. Conceded by Gboly Ariyibi. Attempt missed. Jay O'Shea (Chesterfield) right footed shot from more than 40 yards on the left wing is close, but misses to the left. John White (Southend United) wins a free kick on the right wing. Goal! Southend United 0, Chesterfield 1. Lee Novak (Chesterfield) right footed shot from the centre of the box to the bottom left corner. Assisted by Oliver Banks. Connor Dimaio (Chesterfield) is shown the yellow card for a bad foul. Corner, Chesterfield. Conceded by Anthony Wordsworth. Substitution, Chesterfield. Jay O'Shea replaces Declan John. Corner, Chesterfield. Conceded by Ben Coker. Foul by Gary Liddle (Chesterfield). Substitution, Southend United. David Mooney replaces Tyrone Barnett. Tyrone Barnett (Southend United) wins a free kick in the attacking half. Attempt missed. Declan John (Chesterfield) right footed shot from outside the box is too high. Gboly Ariyibi (Chesterfield) wins a free kick in the defensive half. Corner, Southend United. Conceded by Tom Anderson. Corner, Southend United. Conceded by Oliver Banks. Corner, Chesterfield. Conceded by Adam Barrett. Substitution, Southend United. Sam McQueen replaces Will Atkinson. Ben Coker (Southend United) is shown the yellow card for a bad foul. Attempt saved. Tyrone Barnett (Southend United) header from the centre of the box is saved in the top centre of the goal. Attempt missed. Anthony Wordsworth (Southend United) header from the centre of the box is close, but misses to the left. Oliver Banks (Chesterfield) is shown the yellow card for a bad foul. Corner, Southend United. Conceded by Liam O'Neil. Attempt missed. Declan John (Chesterfield) left footed shot from the centre of the box is just a bit too high. Attempt missed. Liam O'Neil (Chesterfield) left footed shot from the right side of the box is close, but misses to the left. Attempt missed. Jack Payne (Southend United) left footed shot from the centre of the box is close, but misses to the left. Corner, Southend United. Conceded by Dion Donohue.